Why does he have to do that? The first few months can present a bit of a challenge for parents of young children who just became puppy parents. Your puppy has to learn that your kids not only run, jump and shriek, but that it’s also ok being hugged and kissed by them! It's important to praise puppy for curious and confident behaviour around the kids. Never shout at him or punish him when he play-bites. 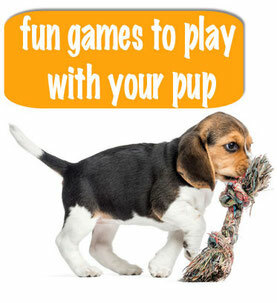 Rather, teach him how to use his mouth softly and teach him to play with his own chew toys (please ask for advice for the best ways to do this or attend a good puppy school). Bear in mind that puppies grow very quickly and what may seem like cute behaviour when he’s little might look quite different when he’s fully grown; use the opportunity to teach your puppy appropriate behaviour around kids whilst he is young and eager to learn. Of course, it's equally important to teach your children how to treat your puppy with respect; encourage them to take part in training sessions and praise your children when they are doing a great job. Don’t forget that both pups and kids have got one thing in common: a very short attention span! Keep mutual training sessions short and fun. It's also important to ensure puppy gets sufficient 'me time' away from all excitements - the kids might need some time -out, too. For further advice on pups and kids growing up together please come and see us.